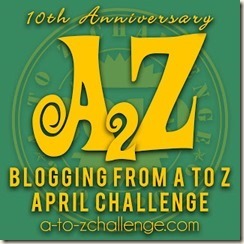 5 Easy No-Cook, No-Fuss Recipes #AtoZChallenge - A Rose Is A Rose Is A Rose! Cooking is love, passion, fun, therapeutic and rewarding for many and it is a chore and a responsibility for many. It’s obvious that the former love to spend hours in the kitchen creating magical dishes and the latter can’t wait to get out of the kitchen. For those who hate to stand in front of the stove, let me share some no-cook and no-fuss recipes. Oh, these no-cook and no-fuss recipes are ideal to introduce kids to cooking too. Also these recipes can be made quickly and easily with lesser ingredients as compared to regular traditional dishes. So whether you are in no mood to cook or have run out of gas or feel it’s too hot to sweat it in the kitchen or are just lazy, here are some Easy No-Cook, No-Fuss Recipes just for you. Slice cucumbers in half lengthwise; trim ends. Cut each half into 3/4-inch pieces. Scoop out the center of each piece of cucumber with a melon baller or a scoop, and fill with about 1/2 teaspoon cottage cheese. Garnish with clover sprouts, and serve. Divide hummus evenly among 8 pita halves -about 1 1/2 tablespoons each. 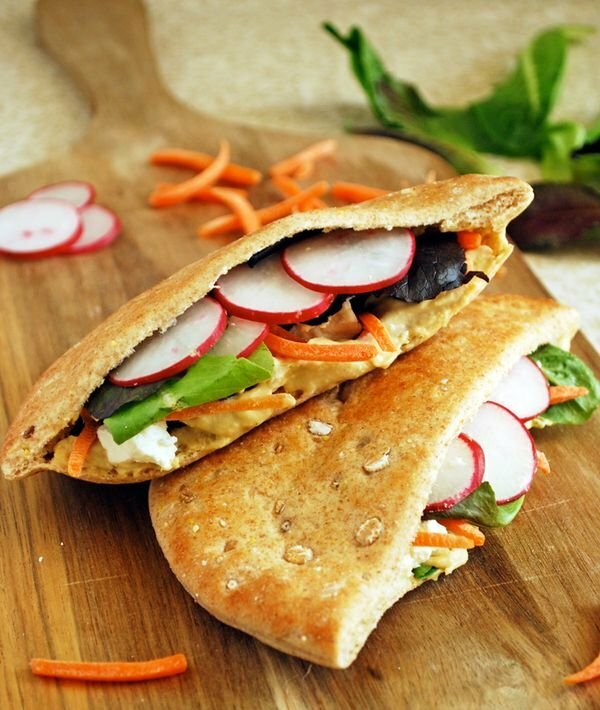 Divide lettuce, cucumber, radishes, onion, and cheese evenly among pita halves. Sprinkle with pepper. In a bowl, blend ground blanched almonds, condensed milk and cream together. Infuse milk with saffron and add the mix into it. Add pistachio into it and blend them well together. Set them in a matki and cover it with butter paper. Pour the milk in the mason jar, add the Nutella and then tightly fasten the lid. Shake the jar vigorously for about 20 seconds, or until evenly mixed. Add the vanilla ice cream and shake the jar to mix all the ingredients evenly. Pour your shake into a glass and enjoy! 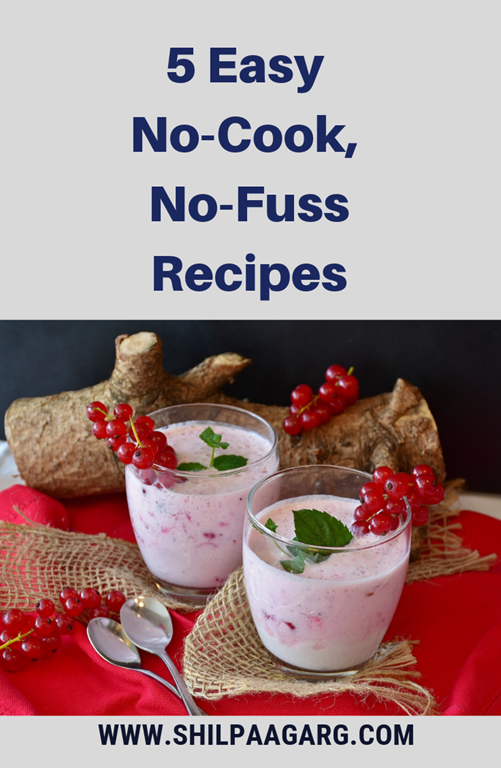 Do you like No-Cook and No-Fuss Recipes? Do you give your gas some rest sometime by rustling up some quick and easy dishes? These recipes are not easy, they are easier than easy! Going to try the Almond Kulfi! I make overnight Oats frequently, will be adding Cocoa Powder to it the next time I do. Who doesn’t like no-fuss cooking? Especially nowadays when everyone is so busy with so many things. 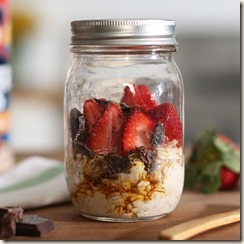 I love overnight oats and make them often but will surely try the others. Great recipes. All appear to be doable easily. infant I had learnt to make the Kulfi. It used to be a dessert in potluck dinners. Indian ice cream as it was popularly called, used to be star attraction. Wow so easy and mouthwatering. Even I, a lazy person, can make them. And almond kulfi is my favorite. I will try it first. The idea of just shaking the jar for that last recipe is so smart… this I wanna try. Would be awesome if it were really that simple. Wonderful recipes. Even i believe that no cook recipes are a great way to involve children in kitchen. And no doubt these are the ones which are loved most by all. I’m passing this on to the children and if I land up with a mussy kitchen you have to share the blame with them! Jokes apart, I loved these recipes – my favourite ones are the first and the last one. Nutella with vanilla ice cream – I’m in heaven already. They are super easy, Shilpa. I have pinned this post and am going to try out some of these when I super bored to cook anything for myself! Great recipes out here. So simple and they look oh so delicious! Overnight oats! Oh So yum! I don’t like cooking at all and that’s why we have a cook at home. I dread the days when she takes leave. I am always out of ideas and mostly have to settle for toast and Maggi for the whole family. These are some really easy and simple recipes, will try these out. Your posts always make me hungry Shilpa. I like the cucumber snack idea and stuffed pita bread too. This is truly a no cook:) no fuss recipes, thanks for sharing and above all I am glad to be connected here shilpa, posting from home. 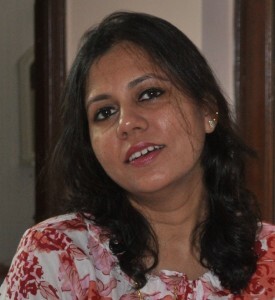 Lovely bunch of recipes, Shilpa. I do love no-fuss recipes once in a while. Great no-fuss recipes there especially in this heat. Will surely try them all out. Love the ideas if hummus and pita, cucumber one is most innovative. I love overnight oats. These are truly easy peasy quick food fixes. No-cook & no-fuss & easy to make! I love the food & drinks. I prepare Nutella shake for my son and he loves it. I love easy to cook recipies. will try the almond malai kulfi. Thanks. 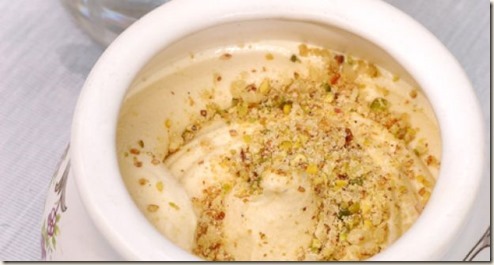 I love Almond Malai Kulfi. all these recipes. Thank you for sharing. I like the oats one. I don’t have any energy in the mornings. So just taking out a ready, chilled, healthy breakfast from the fridge, sounds awesome to me! Thank you! I’m one of those who can’t wait to get out of the kitchen! I love your ideas! Om nom nom nom recipes! Yumm! 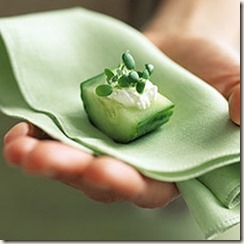 I do cucumber cheese appetizers! Never knew it was a Martha Stewart recipe though 😛 I’m definitely going to try the rest of them all.